This is the limited edition of the first edition of A Thief of Time, which is Tony Hillerman's eighth Navajo Mystery novel. This edition comes with a multicolor slipcase that features a map of "Anasazi Country" and "Sacred Navajo Mountains". 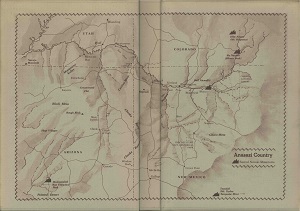 The slipcase was designed by Ruth Bornschlegel and the endpaper map was designed by David Lindroth. Format: Hardback, 24 x 15.9 cm.